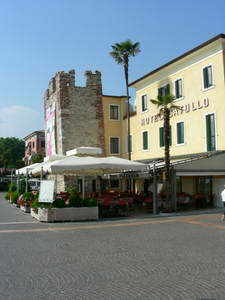 "The Bardolino red wine is lovely, but the town is worth seeing too"
Bardolino is located just below Garda town and is a good sized place with lots of shops and restaurants. A lot of the old part of the town near the lakefront is difficult to drive, so it is often better to park and wander in. Parking can be a bit hard to find sometimes, but you could always get here by boat if you wanted. 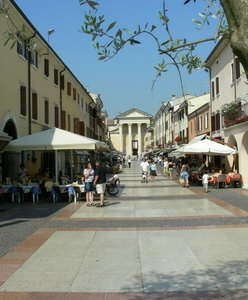 There are loads of nice shops here ranging from shoes and clothes to wine and local art and crafts. You will also find many restaurants tucked away in little courtyards around the town. This is the quieter and best part of town, as the area closer to the main road away from the lake can get a bit busy and noisy sometimes. 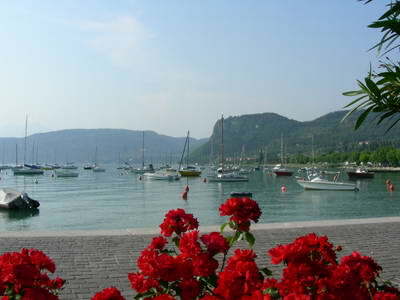 The lake front here is typical of a Lake Garda town, with a port and loads of eating places. The lake front area is quite extensive and the water fountain spraying in the bay is a nice touch. Most of the lakefront walks drop straight off into the Lake, but if you wander along to the north end of the town, you will find a small shingle beach. If you are into wine then you've come to the right place. 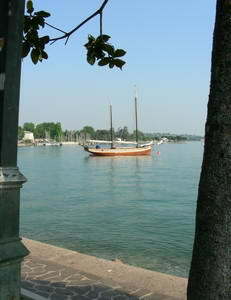 We love the Bardolino red wine with its light and fruity taste, perfect for the hot weather! You can visit the surrounding vineyards, see the wine being made, or perhaps go for a trip to the olive oil museum here.